Without a doubt, Seattle is a hip and happening city full of fresh seafood, great coffee, an amazing food culture and tons of art. TONS. That’s why we approached it as a Art Tour of Seattle With Kids, and it’s just as much fun for the parents. 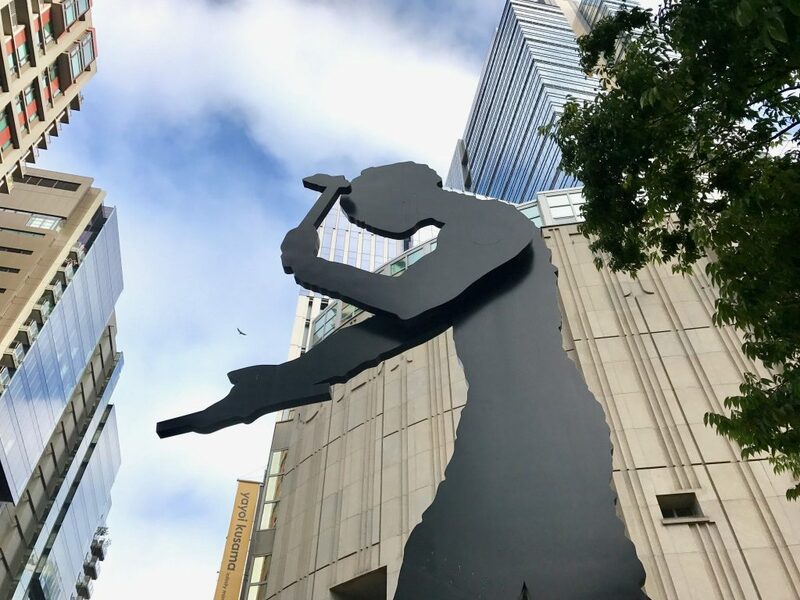 Seattle boasts a great many fantastic examples of public art, as well as showings of enormously talented local artists. 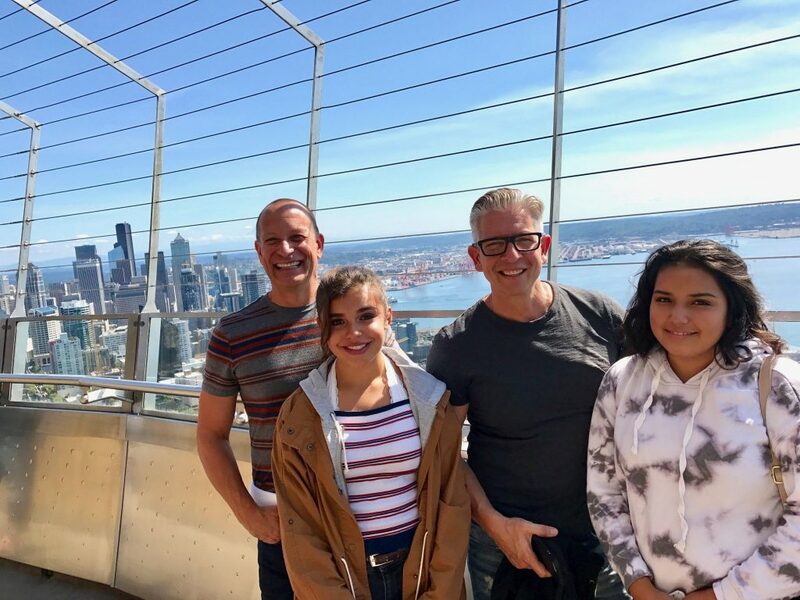 To give you an easy starter list for your Art Tour of Seattle With Kids, our family put together the following high points from our recent visit. Pike’s Market is so colorful and full of interesting things, we could spend all day here rummaging through all the stalls. More like a whimsical Dr. Seuss From Outer Space collection, Chihuly Garden and Glass features incredible artistic works by glassblower Dale Chihuly. Really to call him a glassblower is a vast understatement. Chihuly sculpts glass in such unusual ways with such vibrant colors that is defies the imagination. When we walked into the first exhibition room, we literally gasped out loud at what we saw. Over and over, we asked the kids what they saw in each creation, and our minds were blown with their creativity and imagination. 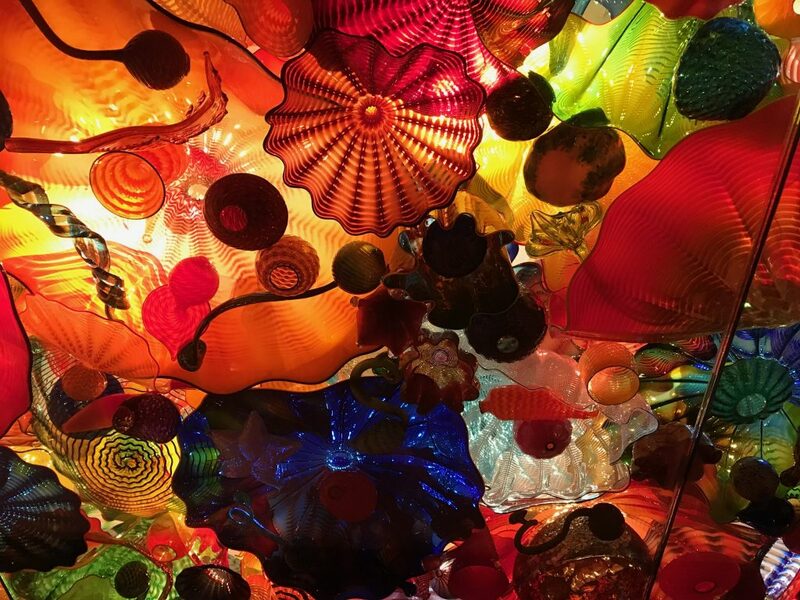 Even the ceilings at the Chihuly Museum are covered with glass art – so colorful and interesting. Outside in the garden, Chihuly has woven his art into natural blooming flowers and plants. Colors of glass creations and the flowers around might be similar so they blend together. In another spot, they are so juxtaposed that it conjures images of another planet. Among the lawns and walkways of Olympic Sculpture Park stand one of the most interesting collections of outdoor sculpture we’ve seen. All are available free to the public on a sloping hill with a gorgeous view overlooking the Puget Sound. We weaved through the park admiring sculpture after sculpture, all so different and interesting. Some were more difficult to decipher than others, which made it more fun. 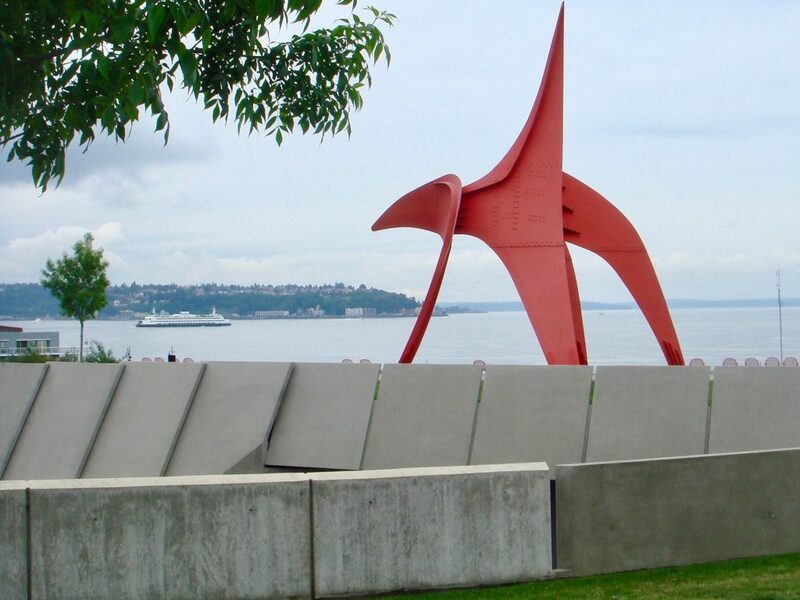 Throughout Seattle’s Olympic Sculpture Park, the views of art battle views of Puget Sound. The sculptures range from monolithic to humorous, from modern to traditional. Plus there are plenty of wide open lawns for the kids to run around and work off some energy. As we walked through downtown, we came across many examples of public/private partnership. High rise office towers, hotels, restaurants and more – they have all committed to making art a part of their Seattle presence. Art abounds thoughout Seattle, including this kinetic sculpture in front of the Seattle Art Museum. We started at the Seattle Art Museum on First Avenue, and walked north through town towards Pike Place Market. Every street had an installation to stop and admire as we walked along. 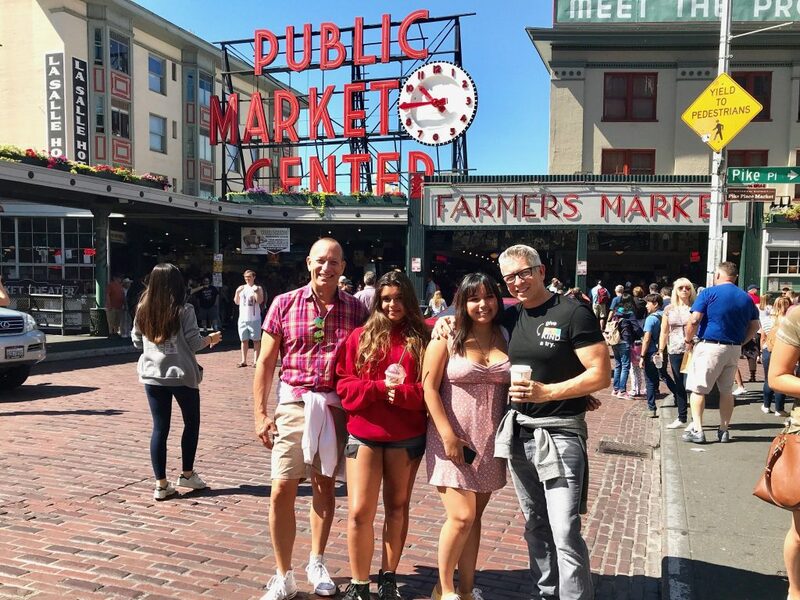 With the gorgeous bay to our left, we could pay homage to the original Starbucks location, and continue along an easy pedestrian mall all the way to Olympic Park. 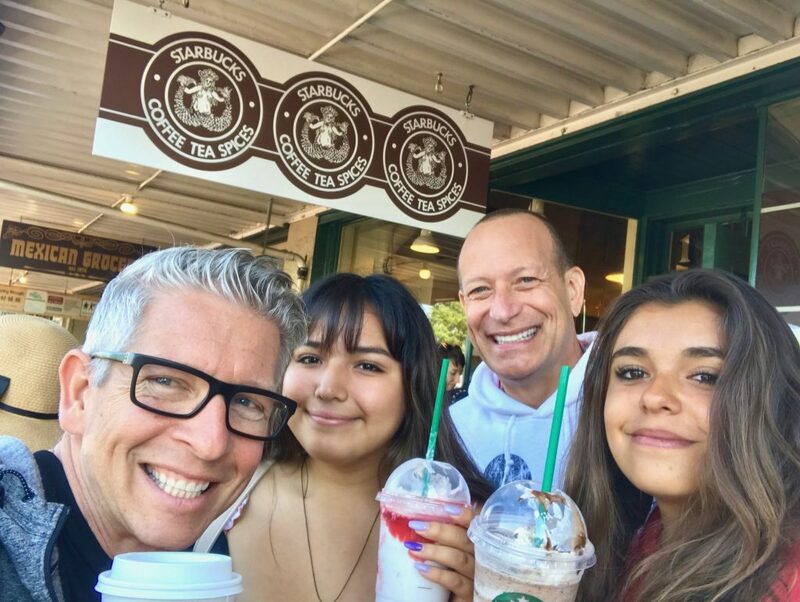 We loved visiting the original Starbucks while on our art walk through downtown Seattle. We would be remiss if we did not include the Seattle Space Needle as a true piece of art. This famous landmark is an artwork all to itself, and worth the visit just to understand the story behind its creators’ vision. 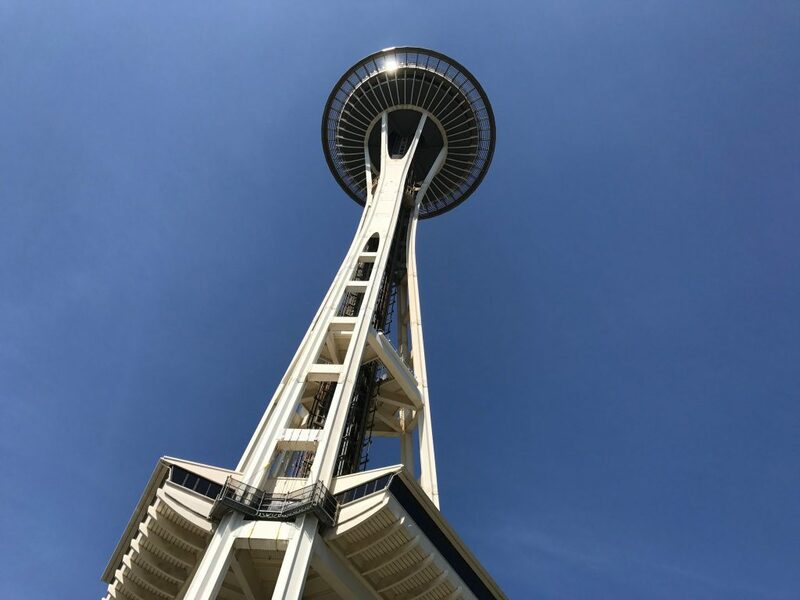 Intentionally designed to look like a flying saucer, the Space Needle is an honor to the race for space. The Space Needle is so cool and futuristic, even decades after it was originally built. There are so many interesting examples of paraphernalia from the 1950s and 60s inside. Plus if you haven’t been to the Needle lately, you are in for a treat. The whole viewing experience has been updated with clear glass instead of the old wire cage. Well worth the visit – plus those incredible views from the top! The view from the top of the Seattle Space Needle is pretty darn awesome. One day we ventured out for dinner to meet family that lives locally. They introduced us to the sweet neighborhood community of Alki Beach, the birthplace of Seattle dating back to 1851. Right on the water, Alki offers crazy-good views of the Olympic Mountains and nearby San Juan Islands across the Puget Sound. And Alki is also full of art. With more historic art lining the waterfront (including a smaller scale replica of the Statue of Liberty), the area is full of creative souls who make a living as artists in many mediums. There are galleries full of paintings and photography, sculpture and jewelry makers dotting the streetscapes. Alongside, there are plenty of cool people who look like they have interesting life stories to tell. 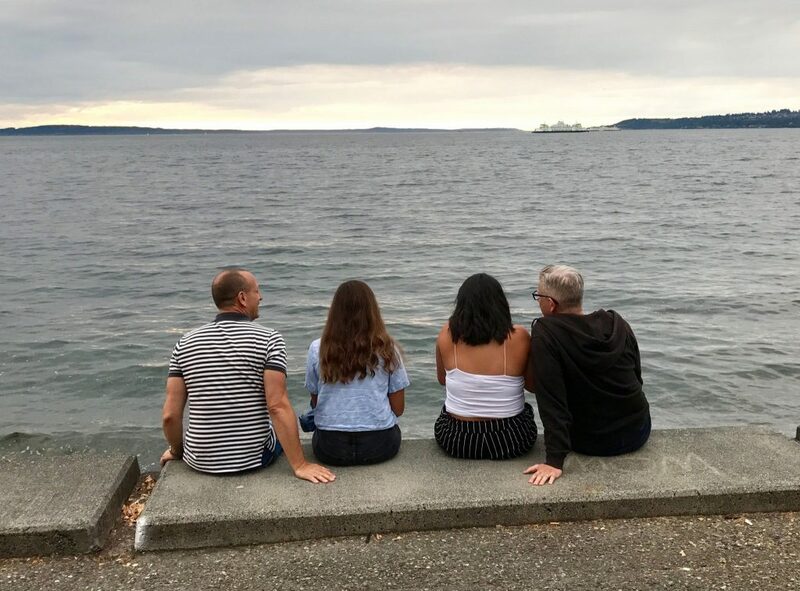 Looking out into Puget Sound, we loved hanging out in Alki Beach. While there, check out Cactus Southwest Kitchen & Bar for dinner. We loved their take on Mexican cuisine, and coming from San Diego that is saying a lot. We can usually judge from a Mexican restaurant’s guacamole if they are going to be good, and this one did not disappoint. They also make a delicious margarita, and offer several non-alcoholic drink concoctions for the kids as well. 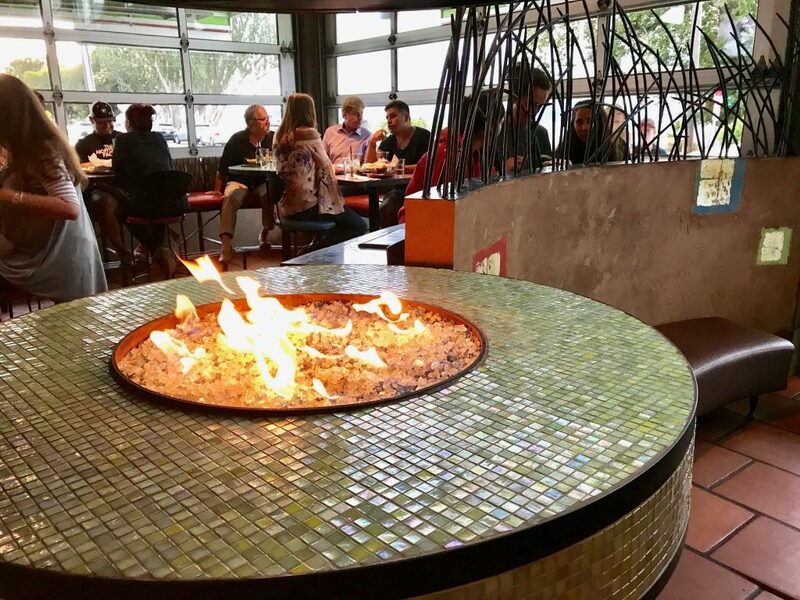 Inside , the fire pit warms up the room as we wait for our guacamole and chips. Las Vegas has more to offer than great hotels, shows, food and of course gambling. In fact, Las Vegas is a place for artists and art lovers to gather and fall in love with the brilliance of modern art. From the lights of the strip to its architectural brilliance, visit Las Vegas for art lovers and the city’s landscape of art inside and out. 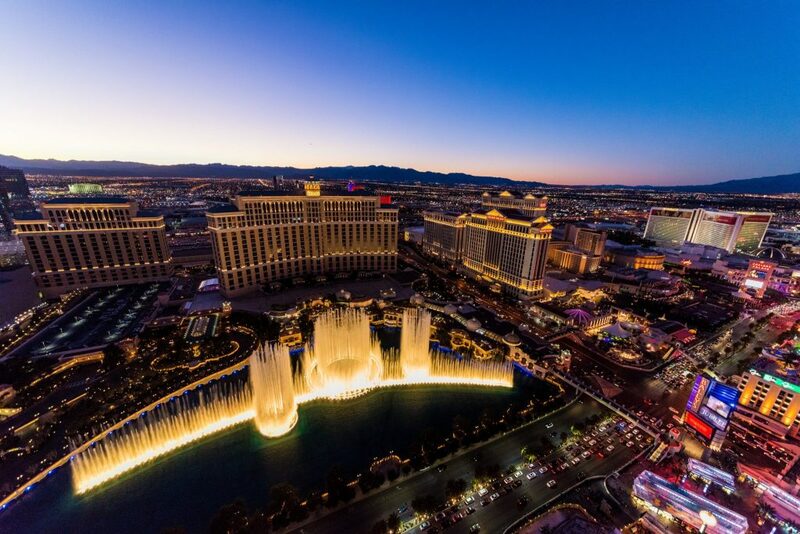 The Bellagio fountain are an art form themselves. Our family has spent hours watching the mesmerizing fountains at the Bellagio Hotel. The last time we were there together, we practically had to pull the girls away from the sidewalk kicking and screaming. When that gets old, go inside the hotel to check out the art gallery. It’s complete with premiere pieces and rotating exhibitions from around the world. The gallery has hosted works from the likes of Picasso and Warhol, as well contemporary artists like sculptor and eclectic artist Yayoi Kusama. The Bellagio Gallery of Fine Art is the perfect place to take the whole family when the neon lights of the strip get to be a little much. 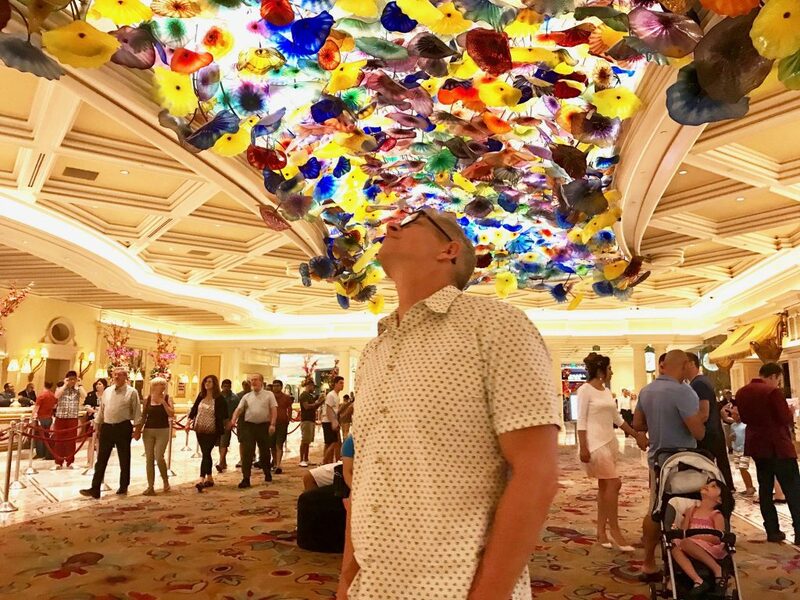 Triton was particularly amazed at the glass flowers on the ceiling of the Bellagio Resort & Casino in Las Vegas. And how about that collection of artistic glass flowers on the lobby ceiling in the Bellagio main entrance? That creation by famed glass artist Dale Chihuly is a modern masterpiece. It’s called Fiori di Como, and is the artist’s interpretation of Italian flowers in the spring. Speaking of neon, art can take more forms than just paintings that adorn museum walls. The Neon Museum is a great example of non-traditional art. This non-profit museum houses and restores iconic Las Vegas neon signs. It’s amazing to see some of the old school marquis signs from the Vegas Strip, so close you can walk up and touch them. Some in this collection are so OG that you’ll have to watch scenes from old movies to even remember where they stood. Actually, the museum is very good at explaining the importance and history of each neon piece of art. This place is a goldmine! Las Vegas is chock full of neon art, practically anywhere you look. The arts in Downtown Las Vegas range from showcases of masterpieces to stunning shops. The Arts Factory is a nondescript building from the outside, but when you walk inside you’ll be mesmerized. There are scores of tenants that bring together art, entertainment, and even cuisine for a perfect artistic experience. 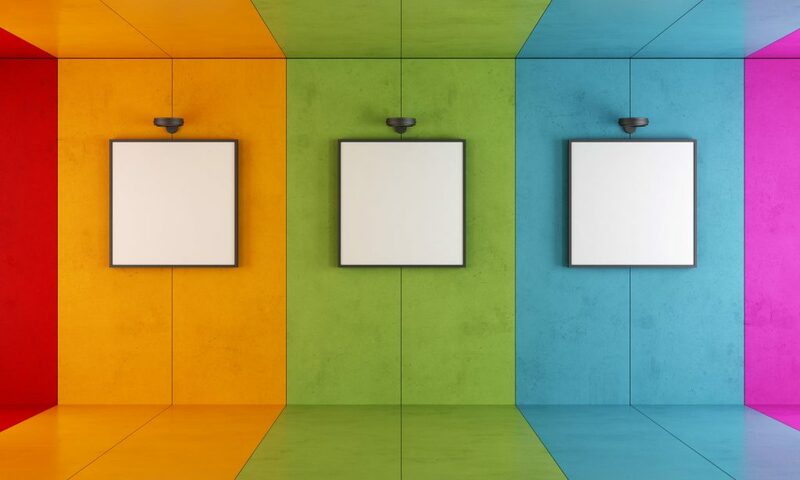 Gaze on the photography of local artists in Perception Gallery, grab a drink between galleries at the The Urban Lounge, and check out Peace N Art Studio, a collaborative gallery of ecletic art. There’s something for every artistic taste at The Arts Factory. 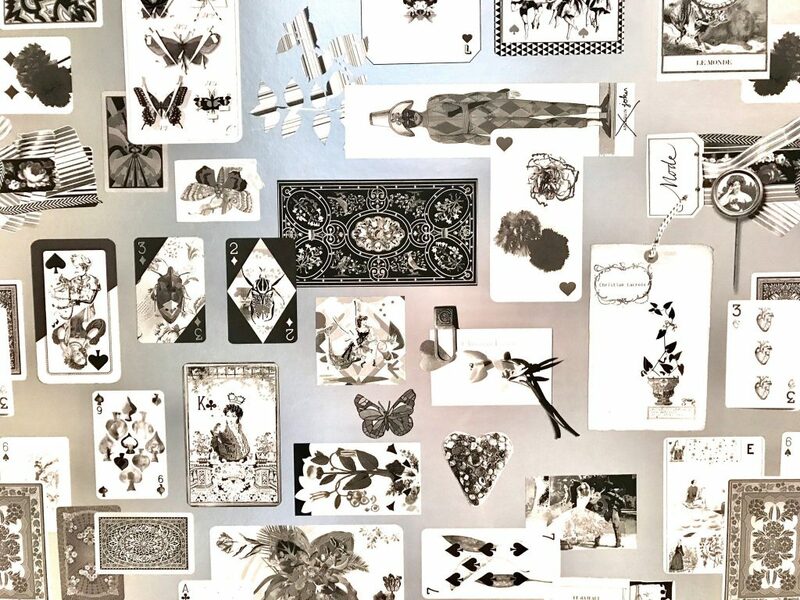 This cool wallpaper pattern at the Cosmopolitan Las Vegas is truly art in and of itself. The MGLV is more than just a place to view local artists. With more than 17,000 square feet of space on Fremont Street, MGLV is the perfect place to apply to exhibit your own work. If you’re an art creator (not just an art lover), you’ll love this hidden gem in downtown Vegas. It also has space to host individual art for shows and sales (after application and fee). For the visitor, it’s fun to see what local artists are creating in Las Vegas. A nice way to mingle with real people outside of the casino world. Sometimes art does not framed the way we expect. Vegas’s CityCenter is a work of art in itself. The architectural design of CityCenter, complete with gorgeous staircases and glass exterior, is home for a large public space of fine art. International artists’ pieces adorn CityCenter to make the 21st century space one of Vegas’s favorite art destinations. Here you can find stunning works by Frank Stella, Henry Moore, Jenny Holzer, Richard Long and more. It’s impressive how the curators have placed art in ways to highlight the architecture of the buildings. 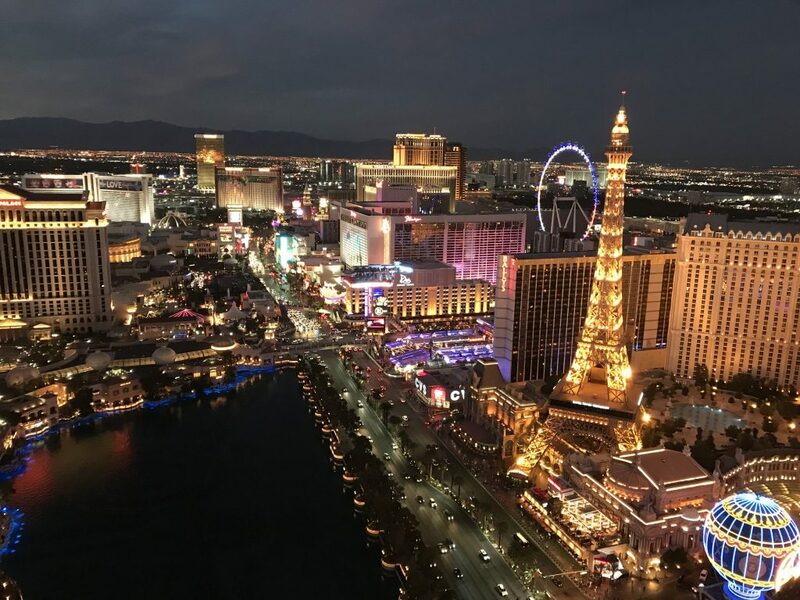 Whether you’re a budding artist, born with a paint brush in your hand, or an appreciator of fine art, Las Vegas is a great destination for art lovers. 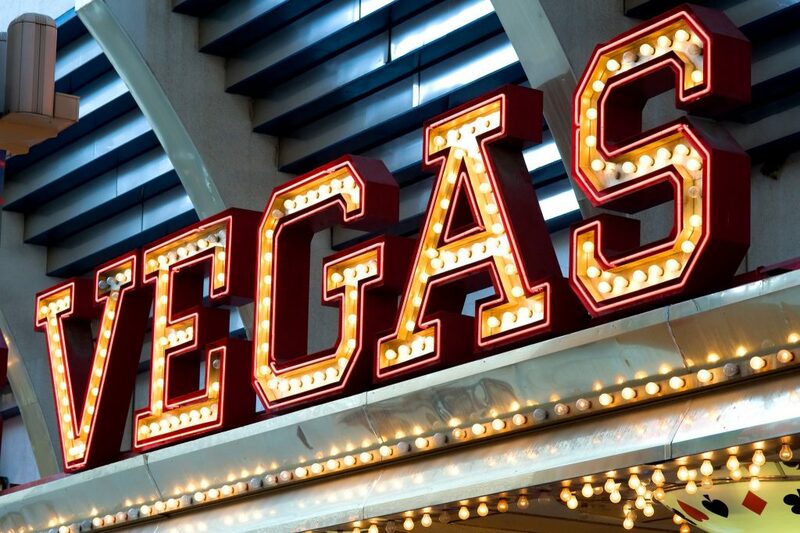 Check out the casinos, sculptures, and galleries that fill the Strip and downtown Las Vegas. The view of the Las Vegas Strip from our room on the 65th floor at the Cosmopolitan Las Vegas – not too shabby. Las Vegas itself is an art form in an of itself, and we had fun finding a little piece of creativity everywhere we looked. Let us know what you find there – we’d love to add new places to our list! Triton Klugh? Or Anderson Cooper? Fairly often, people do a double take. Maybe it’s the gray hair, or the stylish eyewear, or the handsome made-for-TV face, but Triton gets mistaken for Anderson Cooper on the regular. Like that time at the St. Regis Resort in Monarch Beach with Gayle King. Yes, Gayle King from CBS This Morning (and Oprah’s BFF). We took the kids up to the St. Regis for the weekend to play in Laguna Beach (now branded the Monarch Beach Resort), and I guess she had the same idea – get away for the weekend and soak in some California sun. I ran into her at the gym working out before breakfast but didn’t place her, and then when we rousted the kids from their teen slumber and went down to the restaurant, she was there again. Triton (who has mad skills for spotting out random celebrities) knew it was her immediately. I was more doubtful. You know that truth about how celebrities in real life look nothing like they do on TV? Yeah, that. Definitely that. After breakfast, we settled into a private cabana poolside, and I have to say it was pretty lush. We had couches and an entertainment system in the shade, and several cushy lounge chairs in the sun. There was even a fruit basket! I love those little pieces of fresh tropical fruit on the long toothpicks. But I digress. Guess who ended up in the cabana next to us? Yep, good old Gayle. But I still wasn’t convinced, so I camped out on a lounge chair facing her to watch for clues. And that’s when I caught it. The double take. Actually more than a double take, because Gayle was wearing giant sunglasses (so as not to be recognized? Um, yeah…) and she did a full sunglass-pull-down-the-nose-with-a-double-eye-peer-over, complete with squinty eye/steely eyebrow raise. Gayle was so very curious…. And then I tracked her as she looked at me, our kids, back at me, and then back at Triton, as she tried desperately to figure out the whole scenario. Yep, she thought Triton was Anderson. She kept trying to catch his eye to make a connection, which made Triton extremely uncomfortable. “Why does Gayle King keep staring at me?” he asked in a whisper. “Because you are so devastatingly handsome, honey” I answered, and left it at that.